The long wait is finally over…well…sort of. 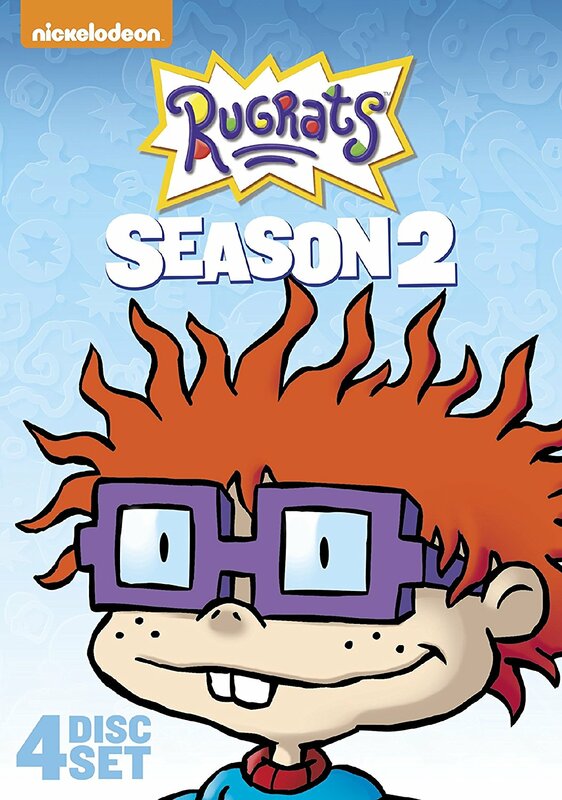 More than a decade after it ended its run on Nickleodeon, Rugrats finally started getting a proper in-store release courtesy of Paramount and Nickelodeon. The companies partnered to release the series’ first two seasons in store this week. This week is not the first time the series has been released. All nine seasons have previously been released via Amazon on Made-On-Demand DVD-R discs. Even with this in mind, this first true official release for the series’ first two seasons proves to be an impressive start for fans waiting years for the series to get any proper release. The seasons’ episodes largely support that statement despite one lingering problem. This will be discussed shortly. The sets’ packaging is another important element to discuss in examining these new releases. It will be discussed later. The sets’ average price point may seem insignificant to discuss, but in reality, it plays its own important part in their overall presentation, too. Each element noted here is important in its own right to the sets’ presentations. All things considered, these sets prove to be collections for which every Rugrats fan has waited and hoped. Paramount and Nickelodeon’s newly released full season sets of Rugrats: Season 1 and Rugrats: Season 2 are everything that the series’ fans have hoped for in a long-awaited proper release. That is proven first and foremost through the seasons’ episodes. Audiences will be happy to know that both seasons are presented here in the same chronological order in which they were presented in their original broadcasts. The only episode that is not included here is the series’ original pilot episode “Tommy Pickles and the Great White Thing.” Why this episode was omitted from Season 1 is anyone’s guess. In defense of Paramount and Nickelodeon, the Season 1 set released by Amazon and Nickelodeon back in 2009 faced the same issue. Considering this, one has to think the omission is linked to someone at Nickelodeon more so than Paramount or even Amazon. Keeping that in mind, the episodes presented in the first and second season of Rugrats in their new home release builds a solid foundation for these sets’ presentations. 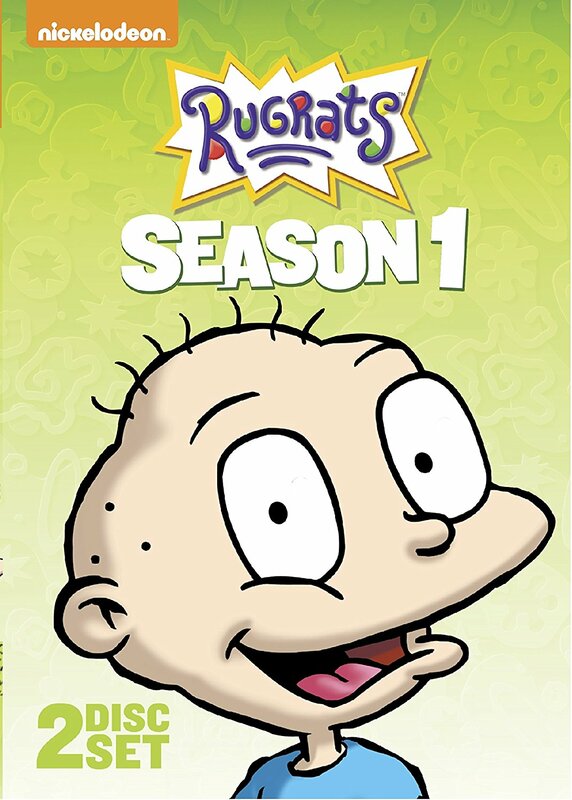 The episodes presented in the first true official home release of Rugrats: Season 1 and Rugrats: Season 2 are in themselves more than enough reason for audiences to own these collections. The episodes’ actual presentations are just as important to note in examining the sets’ overall presentations. Audiences (and especially true fans) will appreciate the fact that the episodes are presented exactly the same way as they were in their original broadcasts. The opening sequence is presented before every episode in both seasons along with each episode’s title sequence. The end credits are there, too along with the post credits sequence, too. Simply put, between the full episode listing in each season and the full presentation of each episode, these episodic elements build a strong, solid foundation for the first official home release of Rugrats’ first two seasons. They are not the only elements to consider. The sets’ packaging is important to discuss in examining their presentations, too. The episodic elements incorporated into the first official home release of Rugrats’ first two seasons form a strong, solid foundation for the sets’ presentations. They are not, however, the sets’ only key elements to discuss. The sets’ packaging is important to discuss, too. That is because of the obvious attention to detail here, too. The sets’ packaging once again places each set’s discs on their own plates inside the ergonomic cases, which in turn protects the discs from scratching damage and saves space on DVD racks. Even more interesting to note is that this time out, Season 1 is spread across only two discs instead of the apparent three that were used in its Amazon release. Season Four is still spread across four discs, just as in its Amazon release. So overall what audiences get in the sets’ packaging is the same attention to disc safety and space saving as was used in their Amazon releases. Considering this, the sets’ packaging proves to be just as critical to their presentations in their new home releases as their episodes. It still is not the last of the sets’ most important elements. The sets’ average price point rounds out its most important elements. The episodes presented in Nickelodeon and Paramount’s new home release of Rugrats: Season 1 and Rugrats: Season 2 and their very presentations are unquestionably critical to the sets’ presentations. Collectively, they form a solid foundation for the sets’ presentations. The sets’ packaging builds on that foundation, strengthening it even more. While both elements are clearly critical both solely and collectively, they are not the sets’ only important elements. Their average price point rounds out their most important elements. The average price point of the series’ first season between Target, Wal-Mart, Amazon and Best Buy is $9.21. Season 2’s average price point is $13.65 when averaged between those same retailers. Considering that Season 2 is longer than Season 1, it is expected that its price would be a little bit higher than that of Season 1. Regardless, the fact that Season 1 averages below the $20 mark and Season 2 averages under the same price with four discs, it goes without saying that both sets are relatively affordable. For this critic in particular, buying both sets through Wal-Mart online proved the most economical. Luckily, having ordered them on a free-shipping weekend, their total price together was just over $20. Keeping in mind this relative affordability of Rugrats’ first two seasons in their first proper home release, the sets’ packaging, their episodes and related items, the whole of these sets’ presentations proves each season to be a must have for any longtime Rugrats fan. It leaves one hoping that the wait for the series’ remaining seven seasons won’t be as long as it was for these two seasons. Paramount and Nickelodeon’s first-ever proper home release of Rugrats: Season 1 and Rugrats: Season 2 are collections that are musts for any longtime fans of the beloved series. Each season’s full episodic run is presented in its respective season save for the series’ pilot episode. That episode was missing from Amazon’s Season 1 release in 2009, too. The episodes are presented in these sets exactly as they were in the series’ original run on Nickelodeon, too, complete with opening and title sequences, end credits and even end slate sequence. It all collectively gives audiences the full experience that they got in the series’ original run. The sets’ packaging and average price point round out its most important elements, proving even more why every longtime Rugrats fan should own these sets whether they consider them re-issues or new releases. They are available now in stores and online. More information on these sets is available online. Nickelodeon and Shout! Factory are teaming up for another new Out of the Vault DVD. It’s hard to believe but it has been a little more than seventeen years since Nickelodeon’s classic animated series The Wild Thornberrys made its television debut. And almost a dozen years have passed since it ended its five-season run. In the years since this classic animated series ended its run it has remained a fan favorite among those that grew up watching it and Nickelodeon’s other beloved Nicktoons. Four years ago, fans of The Wild Thornberrys were finally rewarded for their loyalty to the show when Nickelodeon teamed up with Shout! Factory to start releasing the series in its own standalone season sets. Over the course of the next two years that loyalty would be rewarded even more as the companies partnered to release the series’ remaining four seasons in their own sets. And now next week the companies’ partnership culminates with the release of the show’s complete series run on DVD. The Wild Thornberrys: The Complete Series will be released next Tuesday, December 8th. Regardless of whether or not audiences already own any or all of the show’s previously released standalone season sets, this new collection is a welcome addition to any fan’s home DVD library. The main reason that it is such a welcome new addition is its packaging. This set is packaged in exactly the same format as Nickelodeon and Shout! Factory’s previous Nicktoons series sets. In other words, it is far more ergonomic than having multiple standalone sets. It’s just one part of what makes this collection welcome. While it might not seem overly important on the surface, the set’s pricing is just as important as its packaging. That will be discussed later. Last but hardly least worth mentioning of the set is the episodes. None of the series’ episodes have been omitted here. So regardless of whether or not audiences already own any of the series’ previous standalone DVD sets, they still get every single episode here. It completes the presentation that is The Wild Thornberrys: The Complete Series. Together with its packaging and pricing, all three elements prove The Wild Thornberrys: The Complete Series to be not just a welcome addition to any of the show’s fans but one of the year’s best new box sets for families. 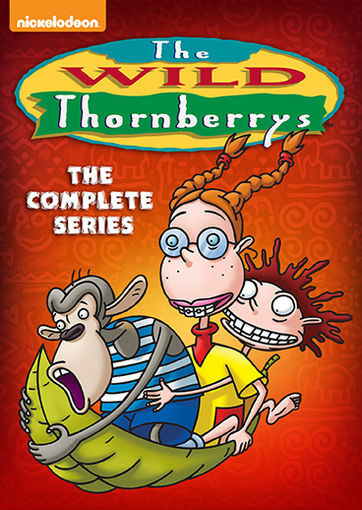 The Wild Thornberrys: The Complete Series is a welcome addition to any fan of the classic animated Nickelodeon series. It is also one of the best of this year’s new box sets for families. The main reason for that is the set’s packaging. Audiences will note with this new box set that Nickelodeon and Shout! Factory have packaged the series in exactly the same fashion as their previous Nicktoons series sets. It has packaged all of the series’ DVDs into two separate boxes within a larger box for a total fifteen-disc set. On the surface one might think that this would be less ergonomic than simply having the show’s standalone season sets. But the opposite is the case. In the show’s original DVD releases, Nickelodeon and Shout! Factory separated Season Two into three separate box sets and combined Seasons four and five into one single box. The end result is a total collection of six standalone DVD sets. This collection takes those six boxes and reduces them to just two boxes. Set side-by-side the full series set actually proves to take up less room on DVD racks than the show’s six separate standalone sets. That is because Shout! Factory and Nickelodeon have once again used the standard packaging method used in its previous Nicktoons series sets. The discs are placed one to a side on either side of the boxes’ inserts. In the case of these two boxes, this allows eight discs to be packaged in the first box and seven in the second. This is a big reason that this collection is more ergonomic than the separate standalone DVD sets. It also protects the discs from one another, which is, again, nothing new for Shout! Factory’s box set releases. What’s more both boxes come complete with their own episode guide. The episode guides are printed on the back of each of the box sets. They list clearly which episodes are included on which disc, leaving no confusion for fans in that arena and round out the ways in which the set’s packaging proves so important to its overall presentation. It is just one part of the whole of the set that makes it such a welcome addition to any Nicktoons Nostalgic’s home DVD library. The set’s pricing is just as important as its packaging. The packaging method used in The Wild Thornberrys: The Complete Series is an undeniably important aspect of the set’s overall presentation. It is the same packaging method used in Shout! Factory and Nickelodeon’s full series sets of their previously released Nicktoons. And just as with those sets, this set’s packaging is more ergonomic than the combination of the series’ standalone season sets. While the set’s packaging is undeniably important to its overall presentation, it is just one part of what makes this new box set such a welcome addition to any Nicktoons Nostalgic’s home DVD library. The set’s pricing is just as important to the set as its packaging. Shout! Factory has the fifteen-disc set listed as retailing at MSRP of $39.93. That is roughly average for such a set. However, thanks to a deal with retailer Wal-Mart, the set is actually available now in store ahead of its nationwide release date for $19.99. That is even cheaper than the set’s discounted online price at Shout! Factory’s online store. That price is $34.93. Twenty dollars for a fifteen-disc DVD set is a relatively affordable price and a smart price at that. Currently it isn’t even listed online via Best Buy’s website or that of Target. It is very possible that this set will be released exclusively via Wal-Mart. And if that is the case, then that $20 price tag (that’s in store. it is listed at $29.98 on the retailer’s website) is definitely another positive to the set. Add in the set’s smart packaging, and it becomes that much more of a welcome addition to any Nicktoon Nostalgic’s home DVD library. Even together they are not the only important factors to consider in the overall presentation of The Wild Thornberrys: The Complete Series. The episodes contained within the box set round out the set’s most important elements. The packaging of The Wild Thornberrys: The Complete Series and its price are both important elements in their own right to the DVD box set. The pricing is just as important as the packaging because of its prince in-store at Wal-Mart stores across the country versus its various online prices. As important as both noted elements are to this box set they are only a portion of what makes the set’s presentation a win. The set’s featured episodes are just as important as its packaging and pricing. Audiences will be happy to know that they get the series’ full run in this box set. Every single episode that was presented in the series’ standalone box sets is also present in this collection. Some might take this for granted. But there are some rare box sets from other companies that try to pass themselves off as being complete sets yet obviously lack certain episodes. Luckily that isn’t the case here. Because it isn’t the case, it makes the price (both in store and online) all the more important. And together with the set’s smart packaging, all three elements come together to make The Wild Thornberrys: The Complete Series a clearly wildly fun collection for any of the show’s fans and for any Nicktoons Nostalgics out there. Nickelodeon and Shout! Factory have teamed up to release another special Nicktoons holiday collection next month. August is almost over and September is about to begin. That can only mean one thing: Halloween is right around the corner. With the unofficial start of the annual holiday season nearing once again audiences are going to start seeing any number of seasonally-themed DVDs and Blu-rays hitting store shelves if they haven’t already. While many of the DVDs and Blu-rays are the same ones that are seen every year, there are some new additions each year. One of the most notable of this year’s crop of new holiday-themed DVDs is Nickelodeon’s new Out Of The Vault: Halloween collection. This new collection of Halloween-themed classic Nicktoons episodes is one that audiences of all ages. The main reason for this is the collection’s episodes. The collection features sixteen classic Nicktoons episodes pulled from five classic Nicktoons series. Their presentation is relatively well-balanced over the course of the disc’s roughly three and a half hour run time. The writing behind each of the featured episodes is just as important to the collection’s enjoyment as the episodes and their distribution. The writing incorporated into each of the episodes equal amounts and frights and fun. Rounding out the reasons that this brand new compilation is so much fun is the various animation styles of each series. It is a subtle factor. But it really shows in the bigger picture one of the most important parts of what once made cartoons great. That will be discussed at more length later. But it is just as important as any of the other reasons noted here. All things considered, Out Of The Vault: Halloween shows in the end to be one of the best of this year’s crop of new holiday DVDs and Blu-rays and one more collection that any “Nicktoons Nostalgic” will want to have in his or her own home collection. Nickelodeon’s new holiday DVD Out Of The Vault: Halloween is one of the best of this year’s new crop of holiday DVDs and Blu-rays. Holidays aside, it is also another collection that any “Nicktoons Nostalgic” will want to have in his or her own home collection. The main reason that it is such an enjoyable watch is its featured episodes. The episodes are not limited to just a small handful from one classic Nicktoon. Rather they are pulled from a healthy spread of the network’s classic animated series. Those series include: Hey Arnold!, Angry Beavers, Aaahh!!! Real Monsters, Rocko’s Modern Life, and CatDog. Each series is well-represented, too with four of the series being represented by three episode each and the fifth—Rocko’s Modern Life—being represented by four episodes. That brings the episode total to sixteen episodes and roughly three and a half hours of programming. In an even larger sense, what such a balanced representation does is give those that might otherwise not have any of the series’ previously released box sets the chance to finally own at least a part of the featured series and kick-start their collections. Keeping this in mind, the episodes presented in Nickelodeon and Shout! Factory’s new Nicktoons Halloween collection show that on their own, they collectively make a solid reason for this collection to be part of any Nicktoons Nostalgic’s home library. The episodes featured in Nickelodeon and Shout! Factory’s new Nicktoons Halloween collection by themselves why this collection is one of the best of this year’s new crop of holiday DVDs and Blu-rays. Of course the episodes themselves are just one part of the reason that the collection proves to be so impressive. The writing that went into the episodes is another reason that this collection proves to be such a solid new release. “Arnold’s Halloween” is just one example of how the writing behind the collection’s episodes makes the collection in whole so much fun. This episode playfully pays homage to both to Orson Welles’ classic radio broadcast of The War of the Worlds. It just adds a little bit of a spin that will have audiences of all ages laughing throughout the episode and will ultimately leave them wanting to watch it again not just during Halloween but during any time of the year. The Angry Beavers episode “The Day The World Got Really Screwed Up” shows doubly just how important the writing behind the collections episode is to the presentation in whole. The first way in which it does so with this episode is the very title of the episode. The title is a playful poke at the classic 1951 sci-fi flick The Day The Earth Stood Still. the episode itself pays tribute to all of the classic sci-fi/horror flicks that were churned out throughout the 1950s. Having Dag and Norbert actually become part of one of those classic films puts its own spin on those classics that will have older audiences and younger viewers alike laughing together at the inanity of it all. “This Is Your Brain on Ickis” is yet another example of how the episodes’ writing makes this collection so enjoyable. As with the noted Angry Beavers episode, the title of this episode of Aaahh!!! Real Monsters in itself an example of how its writing makes it so fun. The title is a playful homage to the 80s anti-drug campaign that told viewers “This is your brain on drugs” as it showed an egg frying in a pan. The episode itself shows the strength of its writing as Ickis shrinks down and takes over monster hunter Simon’s brain. The end result will have viewers laughing tears of joy. It is just one more example of how the writing behind the episodes featured in this collection makes the presentation in whole so enjoyable. There are plenty of other episodes featured throughout this collection that could be used as examples of the strength of the episodes’ writing. Those episodes and the ones noted here together show in whole why the writing behind each episode together with the episodes themselves makes Out of the Vault: Halloween a must have this Halloween for any Nicktoons Nostalgic. 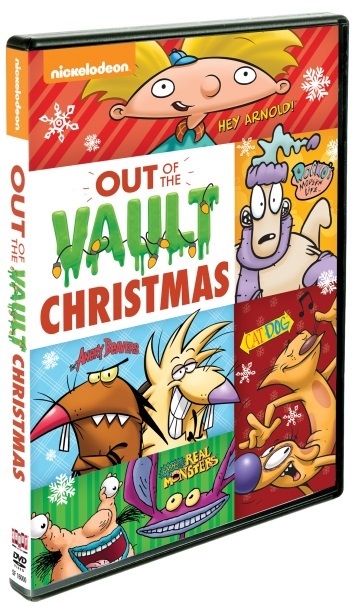 The episodes featured as part of Out of the Vault: Halloween and the writing behind each episode both make for plenty of reason for any Nicktoons Nostalgic to add this DVD to their personal home DVD library. While both of the noted elements are clear reasons that this collection shines so brightly, the animation presented in each series proves to be just as important to the set in whole. Most people probably won’t pay that much attention to the animation style of each series presented in this DVD. But the reality is that the animation style of each series is just as important to the enjoyment of this collection as anything else. That is because it serves as a reminder of the artistic originality that once made cartoons so great. By comparison there is a troubling lack of that artistic creativity and originality in today’s cartoons. The series on television today by and large don’t even deserve to be called animated series being that they are cookie cutter creations made by computers rather than the human hand. Looking at the animation style of each presented series, it reminds audiences of the importance of putting one’s heart and soul into a cartoon rather than just moving a mouse and using a bunch of desktop tools. From the somewhat grainy look of Aaahh!!! Real Monsters to the softer design style of Hey Arnold! and CatDog to the rigidity of the animation in The Angry Beavers and even the almost free-flowing style of Rocko’s Modern Life the different animation styles within each series serves to give each series just as much of its own identity as the writing behind each series’ episodes. Both of those elements come together with the episodes themselves and their balance from one series to the next to make fully clear why Out of the Vault: Halloween is a must have for any Nicktoons Nostalgic and one of the best of this year’s crop of new holiday DVDs and Blu-rays. Next month, Nickelodeon and Shout! Factory will release another new installment of classic Nicktoons episodes when it releases Out of the Vault: Halloween Collection. Out of the Vault: Halloween Collection will be released Tuesday, September 1st alongside Shout! Factory Kids’ new Littlest Pet Shop Halloween DVD Halloween Festival. 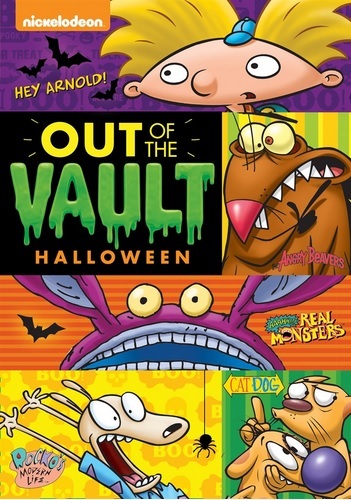 Out of the Vault: Halloween Collection features ten episodes from Nickelodeon’s classic Nicktoons series. 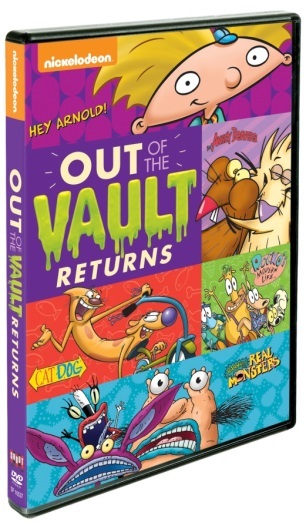 Among the disc’s highlights are Hey Arnold!’s “Haunted Train,” “Sugar Frosted Frights,” from Rocko’s Modern Life and “The Switching Hour” from Aaahh!!! Real Monsters. “Haunted Train” follows Arnold and his friends as they take a trip on a train that Arnold’s grandpa (Dan Castellaneta—The Simpsons, Futurama, The Batman) told them was a train to that place way down south. Of course the reveal is far less scary than Arnold and company were led to believe. “Sugar Frosted Frights” has Rocko’s pal Filburt having to fight his fear of Halloween. And in “The Switching Hour,” the series premiere of Aaahh!!! Real Monsters, Crumb and company disobey The Gromble (Gregg Berger—Garfield & Friends, The Garfield Show, Star Wars: The Clone Wars) and go out on Halloween. This leads to a bit of a mix-up thanks to a child scared by Ickiss dressing up just like him for Halloween. Of course this leads to its own share of Halloween fun for the whole family. It’s one more of the disc’s episodes that audiences will love to watch this Halloween and the days leading up to the big night. The full episode listing for the DVD is noted below.